As always when these articles appear, I noticed some comments by people calling Generation Y lazy (my hunch is this is a Boomer or a Gen X calling Gen Y’s lazy). I believe that we can emotionally support our children by stopping this name calling. With the Millennial Leaders project, we interviewed multiple Generation Y business leaders who are working very hard and who are giving back to the world through establishing non profits and working for organizations like the Peace Corps and Teach for America (if you want to be inspired, read the chapters in our book on Mari Moss and Nathan Rothstein). So to call these kids lazy is perpetuating a stereotype that feeds a negative message to these young men and women. As a parent of 3 Gen Y’s, I believe that by instilling a sense of contribution back to society and by teaching them that to spend money, you must be willing to work to earn it (right now, that’s the way our economy works…money is a medium of exchange, and it does not grow on trees). And, along the way, we can help our kids build emotional muscles by teaching them that mistakes and failure (let them be late for work, let them make a bad grade) are a part of maturing into adulthood. Finally, the invention of cell phones and e-mail are not helping this situation with over-involved parents. As parents, we need to resist the urge to pick up the phone at the drop of a hat. It sends the message that we will always be there to bail our kids out, and to be honest…they don’t want this. They are telling us to stop calling their college campuses and their employers. So, as a boomer to other boomers, we can do something about this, and we can start by taking responsibility for helping create this worry and doubt by always giving our kids a pillow to land softly.. This is an interesting article from Newsweek (features Jean Twenge who is featured in Chapter 2 of Millennial Leaders). Many of the people who commented felt that the article is a bit negative, so I encourage you to read the comments section. 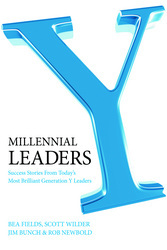 This area will help you gain an understanding of what is really going on with Gen Y. As I have said…They did not get there alone! They are products of parenting, the media, technology and the world at large.